Every new Volvo reassures its buyer with pioneering road safety aids, premium build quality and of course, comfort. Rough weather road competence is a given because Sweden is their birthplace, and what’s normal weather to Sweden is hell to us Brits. The new V60 is aimed at the executive family buyer who seeks to combine business and pleasure in a sleek and rather large estate car, not to be mistaken with their best selling XC60 SUV. The V60 is more a statement of style rather than the XC60’s practicality, yet the V60 is still able to boast the biggest luggage capacity in class. Your choice matters here rather than mine, but to this observer the V60 is the image maker whilst the XC60, well, isn’t. Regardless of choice, in a modern-day Volvo your partner, children, grandparents and friends will be sitting in a safety vessel packed with driver aids, and not far off disarming you of the need to drive at all. You have to look through the window to see where you’re going of course, but once you’ve decided to move off, the world’s biggest list of driver aids kicks in, reminding the Volvo driver that autonomous driving or driverless cars are just around the corner. Volvo’s standard City Safety system takes care of the human error element with automatic emergency braking with pedestrian, cyclist and large animal detection, and steering support to help you around an object in an emergency. It also features the world-first application of automatic braking to help avoid a collision with an oncoming vehicle. If even that is too much driving for you, the optional Pilot Assist Semi-autonomous drive technology can take care of the rest. This helps with the steering (up to 80mph) and controls the acceleration and braking required to keep the car safely within lane markings and at the desired cruising speed or distance from any vehicle in front. If, however, driving is of interest we are pleased to report that the V60 does not disappoint. There are a range of engines to choose from; two diesel variants 150 bhp (known as the D3) and 190 bhp (D4), and the petrol engine 250 bhp T5. All engines are made by Volvo (now there’s a sign of brand confidence), the only manual option being the diesel variants. 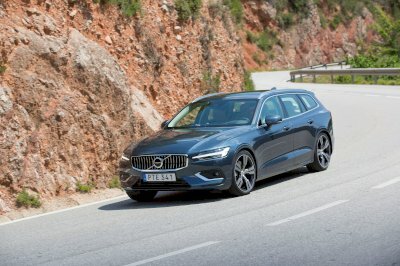 Whilst driving a V60 is inevitably ‘easy’, the manual entry level car is the more engaging behind the wheel, whilst the more powerful D4 has oodles of torque and easily qualifies as the best long-distance cruiser. Ride quality is not an issue, albeit rather firmer than the V60’s size and bulk suggest. This is where the fine balance between cosseted cruiser and all-weather ruggedness and grip shake hands, and end up somewhere in the middle in the ride quality department. Our driving impressions are based on only a few hours behind the wheel of both diesels on the car’s UK launch – the T5 was not available – but it was enough to reassure us of this Volvo’s on-road capabilities. The ad infinitum driver aids provided good passive safety, and why complain about something designed to keep you safe? If you don’t like computers taking control of your steering whilst you are distracted by your Sat Nav, Spotify, heating controls, hands-free phone calls, your partner, the baby crying, the dog, and the stupid guy hogging lane three at 50 mph on the motorway up ahead, then just switch it off. £31,810 gets you into entry level D3 ‘Momentum’ V60 ownership, the ‘Inscription’ is the higher spec model with the petrol engined T5 hitting the price range peak at £40,670. Volvo reckon the pending dynamic R-Design spec will be the best seller in the UK; we tend to buy high end. For the business and economy conscious the D3 is the most tax efficient version with CO2 emissions of just 117g/km and Company Car tax from only £147 per month. PCP and PCH purchase deals can start from as low as £299 a month, and business car leasing deals from as little as £316. Volvo are technological leaders, investing heavily with brand confidence in their own engine technology, whilst remaining the standard setters in family vehicle safety. The role of the driver and the scope for driver error is reduced to a minimum by fool-proof driver aids, a factor which is inviting to some and maybe off-putting to keener drivers. You can’t win ‘em all as they say, but if you buy into V60 conceptually, we doubt you’ll be dissatisfied.